3. 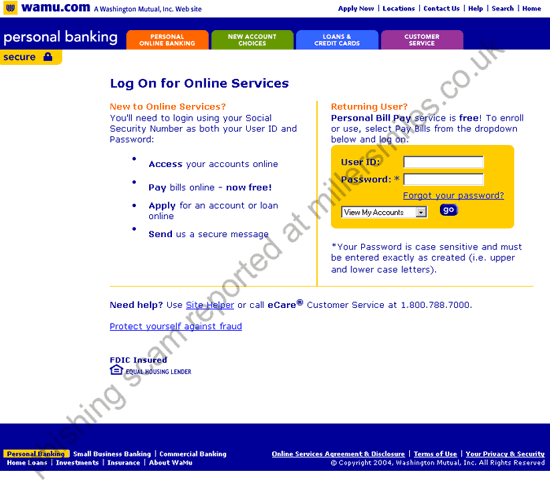 URL of spoof website disguised as https://login.personal.wamu.com/logon/logon.asp?dd=1&Update&Your&Info. This looks secure (https) but is NOT!
" Washington Mutual is committed to maintaining a safe environment for its community of buyers and sellers..."
Washington Mutual is committed to maintaining a safe environment for its community of buyers and sellers. To protect the security of your account, Washington Mutual employs some of the most advanced security systems in the world and our anti-fraud teams regularly screen the Washington Mutual system for unusual activity. We recently have determined that different computers have logged onto your Washington Mutual Online Banking account, and multiple password failures were present before the logons. We now need you to re-confirm your account information to us. If this is not completed by Feb 15, 2005 , we will be forced to suspend your account indefinitely, as it may have been used for fraudulent purposes. We thank you for your cooperation in this manner.